Haidakhan Babaji, simply called Babaji or Bhole Baba by his students and devotees, was a teacher who appeared near the village of Haidakhan in northern India (Uttarakhand) and taught publicly from 1970 to 1984. According to "The Teachings of Babaji," Haidakhan Babaji "appeared" in June 1970 in a cave at the foot of the Kumaon Mount Kailash, across the river Gautama Ganga, near a remote village called Hairakhan, in the Nainital District of Uttrakhand, India. His followers maintain that Haidakhan Babaji is a Mahavatar – "a human manifestation of God, not born from woman." It is reported that starting in late September 1970 Haidakhan Babaji spent forty-five days meditating in a small temple on the top of the Kumaon Mount Kailash "without leaving his seat." In September 1971, Haidakhan Babaji, in a sworn testimony, convinced the judge of the court in Haldwani that he was the "Old Hariakhan Baba,” thought to be active in that region in the years 1860–1922, and that he had the right to use the ashrams in Kathgaria and Haidakhan. In 1971 Haidakhan Babaji started travelling across India, proclaiming his Message, performing sacred ceremonies, such as yagna, and attracting more devotees. This included celebrities, such as Shammi Kapoor, and gradually more Westerners. Haidakhan Babaji maintained that: “All religions are incorporated in the principle of Truth, Simplicity and Love.” In his living years he taught intensively the importance to live a simple life with loving principles in truth. Although worshipped according to local customs, Haidakhan Babaji explained that he came to restore Sanatana Dharma rather than Hindu Dharma (Hinduism). Sanatan Dharma can be understood as a primordial religion reflecting natural laws established at the beginning of the Creation. He explained further: "I have come to guide humanity to a higher path. I do not belong to any particular religion, but respect all religions. I seek the elevation of all mankind. " He stressed the unity of all religions as expressed in the following words: "In any town there is always a central place; all the roads in the town or from out of town lead to that central place. Similarly, all religions lead to one point, and that is God Himself; and therefore following any religion you will ultimately reach God." He said: "We are all one with each other and with God." Haidakhan Babaji said: "You should seek harmony in everything you do. I am harmony. Thank you for your love." Haidakhan Babaji proclaimed: "One can follow any religion, one can follow any practice or path, but one must be humane." He said: "The world now is in a state of turmoil. It is suffering from three kinds of pain – physical, mental, spiritual – and there is only one way of being cured from these. We have to root out inhumanity and replace it with humanity. (…) He also made the following statement: "The only true man is one who practices 'humanism.' (…) this is the only way to success in life." Babaji talked about the importance of hard work and proper performance of one’s duty so often that Karma Yoga should be considered the central element of his teachings. Babaji used to say that: "Work is worship" and that hard work is the best spiritual practice. On another occasion he said: "If you are engaged in doing good deeds and go on doing good acts, you will have good sleep, good appetite and bad thoughts will not cross your mind. Otherwise, you will always be criticizing others. In inaction, your minds will always be engaged in thinking critically of others. Karma – activity – is the only thing which can drive out all evils.” Babaji also taught that "perfection in work" was the real meaning of Kriya Yoga. Have faith! Reciting the Name of the Lord is not the first, but the last stage of spiritual practice! When lions enter the forest, the other animals run away. Likewise, all evil thoughts will vanish with the recitation of the Lord's name. Reciting the Name of the Lord will bring you the company of a good people and you will be near saints. Blessed are the few who will discard the kingdom of the world for the Lord's name. Such a devotee always resides in My heart. In the womb, you take a vow not to get attached; but as soon as you come out, you get entangled. Abandon attachment! Your mind plays tricks on you! That is why you are after pleasures! All worldly things - including the desire for liberation - are obstacles to which you are attached. If you want divine peace, leave behind ignorant karma. He explained that God's name is the most powerful sound of the Creation – "more powerful than a thousand atomic and hydrogen bombs." – and that this is the only real thing. Haidakhan Babaji especially recommended the use of the mantra "ॐ namaḥ śivāy" (Sanskrit: ॐ नमः शिवाय् ) - while "ॐ" is mostly transliterated as "oṃ" or "auṃ") - because of its protective qualities, but also stated that one can use any God's name "his religion teaches." The mantra is always written internationally simplified as "Om Namah Shivay" in books about Babaji written in English or other languages. Haidakhan Babaji warned his followers about the forthcoming Great Revolution or Maha Kranti. He described Maha Kranti as involving "earthquakes, floods, accidents, collisions and wars (...)." In the context of these upcoming calamities, he called for courage: “Walk on with courage and bravery. Go on working to improve humankind and establish the Path of Truth. (…) Fight for truth! To face life you must have great courage every day.” Haidakhan Babaji urged his followers to be "inspired." He stated: "Everything in this world is 'PHURO' – transient. It has no reality. True reality is to proceed on the path of truth, to keep the company of saintly people, and to render service to men." Babaji advocated on behalf of the less-fortunate. He stated: "you should look to the areas of your countries where people are poverty-stricken and helpless and then do all you can to raise their standard of living, teaching them cleanliness and high morals. To serve the needy truly and from the heart is true service to God. (...)"
Babaji would typically start his day around 3:00 am, with a bath, often in cold Gautama Ganga, which was followed by meditation or a fire ceremony. Around 5:00 am he would see his devotees for ceremonial chandan (placing a mark on forehead), followed by morning Aarti (devotional singing) around 6:00 am Then until noon everybody would be engaged in some form of karma yoga. At noon the only meal of the day was being served, followed by more karma yoga in the afternoon. Sometimes a more elaborate ceremony such as havan would be performed around the noon time. Havan is a fire ceremony. In the afternoon, Babaji would sometimes see the devotees for individual audiences, known as darshan. Then there would be another bath, followed by the evening Aarti. After the evening Aarti, Babaji was giving short speeches that were recorded in "The Teachings of Babaji." 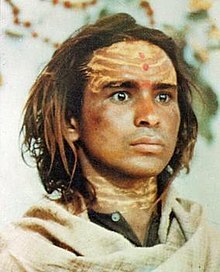 Mahavatar Babaji – it appears that Haidakhan Babaji pointed out or implied a few times that he was identical with Mahavatar Babaji described in Yogandanda's "Autobiography of a Yogi." This claim is apparently disputed by the Self-Realization Fellowship, the society founded by Paramahansa Yogananda. The practices of these latter differ. Those by Baba Haidakhan were much simpler and did not involve any secret ceremony. Messenger – Haidakhan Babaji would sometimes refer to himself as "messenger of revolution” He often urged the followers to "spread his Message." Mahaprabhuji – on one occasion Babaji stated: "I am Bhole Baba (Simple Father). I am nobody and nothing. I am only like a mirror in which you can see yourself. I am like a fire. Don’t keep too far away or you will not get warmth. But don’t get too near or you may burn yourself. Learn the right distance. My name is Maha Prabhuji (The Great God)." Vishnu Dutt Shastriji said the following about Mahaprabhuji: "Sitting here at Haidakhan, Mahaprabhuji has control over every particle of the Creation by the power of His mere wish, by His very thought. (...) Mahaprabhuji has control over the elements, the spiritual world – to say nothing of the world of men. He is the Creator, Sustainer and Destroyer of the world. Not a single blade of grass can grow but that He wills it. He has incarnated in a human body for the welfare of mankind. His sole desire – is to make it possible for the whole world to be liberated. He shall do His utmost to achieve liberation of the world." The Guru of all Gurus – Gaura Devi recorded Babaji saying: "I am no one’s Guru, but I am the Guru of gurus." I am everywhere – Haidakhan Babaji was recorded saying: "I am everywhere – in your every breath. I have come to help you realize unity beyond division. I will show you a freedom you have not imagined. You must seek that unity from whence there is awareness that we are all one. Seek harmony in all that you do. I am harmony. If you are in peace, I am in peace. If you are troubled, I am troubled. If you are happy, I am happy. Be happy. Have faith – everything depends on faith." ^ Haidakhan is also spelt at times as Hairakhan because the central sound in the name does not exist in English and is something between the R and D sound. Perhaps the best way to write it would be Hairdakhan but that is not usually done. ^ Radhe Shyam. (1990). I Am Harmony. PP.125–135. ^ Radhe Shyam. (1990). I Am Harmony. P.158. ^ See for instance: Gaura Devi. (2001). Fire of Transformation. My life with Babaji. ^ See for instance: Orr, Leonard, 1988, 1995. ^ The Teachings of Babaji. 2 February 1983. ^ The Teachings of Babaji, 25 March 1983. ^ The Teachings of Babaji, 29 July 1983. ^ The Teachings of Babaji, 2 April 1980. ^ The Teachings of Babaji, 12 April 1980. ^ More on this subject can be found in the book: "I Am Harmony", by Radhe Shyam (1990). ^ The Teachings of Babaji, 29 October 1983. ^ The Teachings of Babaji, 23 October 1981. ^ a b c Radhe Shyam. (1990). P.xvi. ^ E.g. "Chant OM NAMAH SHIVAY and you can defy death." The Teachings of Babaji, 28 July 1979. ^ Gaura Devi. (1990). Babaji's Teachings. P.6. ^ For more description of daily routines around Babaji see also Gaura Devi (2001), for instance PP.63–67, 73. ^ The Teachings of Babaji, Foreword. See also Radhe Shyam. (1990). PP.50–65. ^ The Teachings of Babaji, Foreword. ^ The Teachings of Babaji, e.g. 14 September 1981. ^ Gaura Devi. (1990). Babaji’s Teachings. P.7. ^ Gaura Devi. (1990). Babaji’s Teachings. P.9. ^ Babaji Mahavatar. "The descent of Eternity into time." (1983). Back cover. See also: The Teachings of Babaji, 12 April 1980. Gaura Devi. (1990). Babaji's Teachings. Allahabad: Haidakhandi Samaj. This page was last edited on 5 February 2019, at 16:56 (UTC).